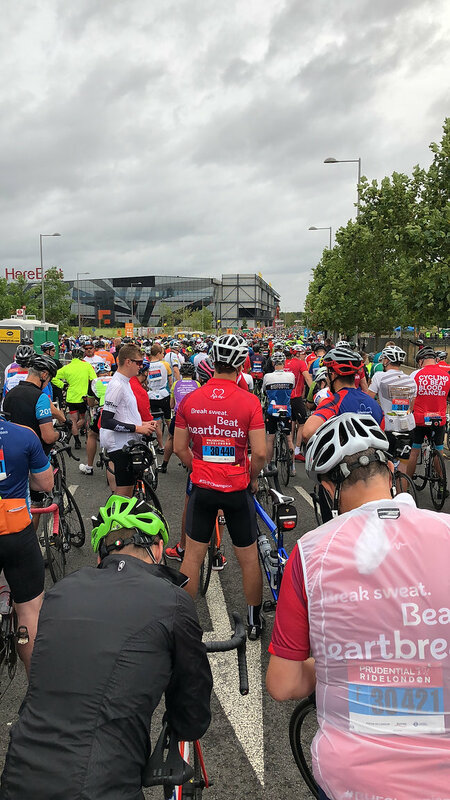 “According to the Starter at yesterdays Prudential RideLondon – Surrey 100, to give it it’s full title, London has seen 75 days of unbroken sunshine. That all came to a sudden halt early yesterday morning when there were dark clouds, wind and rain even before I had left our overnight accommodation. The forecast was for light rain followed by heavy rain over late morning and early afternoon before going back to light rain. So, what to wear? How light is light rain? I don’t want to be too hot but I hate being wet when I’m riding. Do I wear my light showerproof jacket (which is far from showerproof actually) or my better waterproof one? What about overshoes? Will they be too much, will my feet cook? The debate went on in our house amongst the team with everyone having differing views. In the end I decided on the better waterproof jacket and I put my overshoes in one of the pockets. Sorted, or so I thought. Unfortunately, our team all had different start times so I made my way to the start at the Olympic Park on my own. It wasn’t raining and by the time I got there I was hot and it was only 6:45am. Was this jacket a good idea; am I going to carry overshoes in my pocket for 100 miles and not need them? As I stood by the truck waiting to hand in my rucksack that would be taken to the end of the ride for me, I very nearly put them both in the bag. I am so glad I didn’t! Once out of London and into the Surrey Hills, the conditions were treacherous. Lots of riders suffered punctures and there were some nasty looking accidents. The roads were very wet and slippery. Puddles reached almost all the way across the road in some places. The roadcraft of some riders could have been better with them moving all over the road without checking riders behind them. The two big hills, Leith Hill and Box Hill, really didn’t seem too difficult compared to what I had been lead to believe. Unfortunately I had to stop and walk up a short part of Leith Hill due to riders not keeping left and consequently blocking the road for others. But Box Hill I rode up without needing to stop and found it relatively easy, it’s just long. Once off Box Hill, we headed into Leatherhead. Back to wider roads, smooth tarmac and the rain finally stopped – after 80 miles. I felt really good and decided to hit the last 20 miles hard. I would give it everything I’d got. Those 20 miles took me just an 1hr and I really enjoyed them. Finally, I turned left up towards Trafalgar Square, left again through Admiralty Arch and I was on The Mall. I could see the finish line and decided to give it one final push. I crossed the line 7hrs and 5 mins after leaving the Olympic Park having been in the saddle for 6hrs and 16mins. I was delighted and still felt really good. 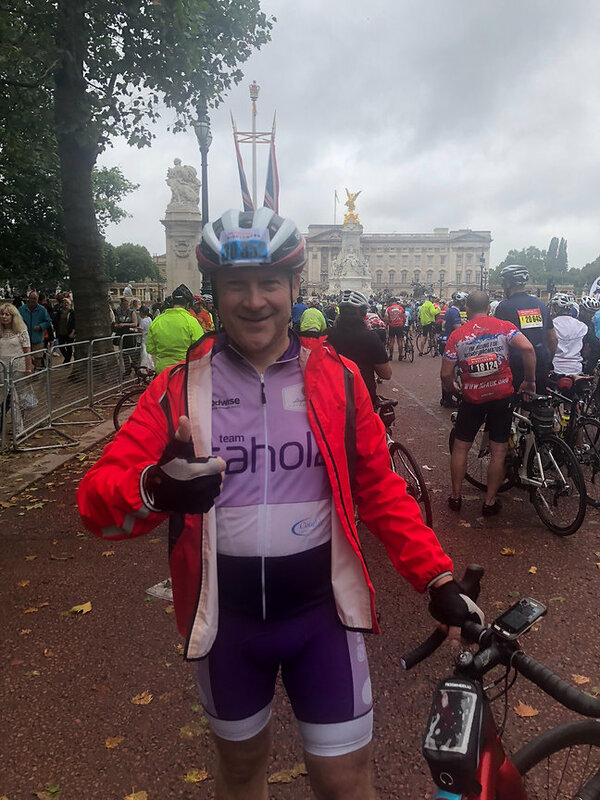 As I stood looking at Buckingham Palace, the finish line, and all the riders surrounding me, a gentleman came over and asked if I would take his photograph. We agreed to photograph each other. Riders were everywhere. I collected my medal (it’s really heavy, what are they made of?) and my rucksack. Then I jumped back on my bike to cycle to Kings Cross to find a train home. 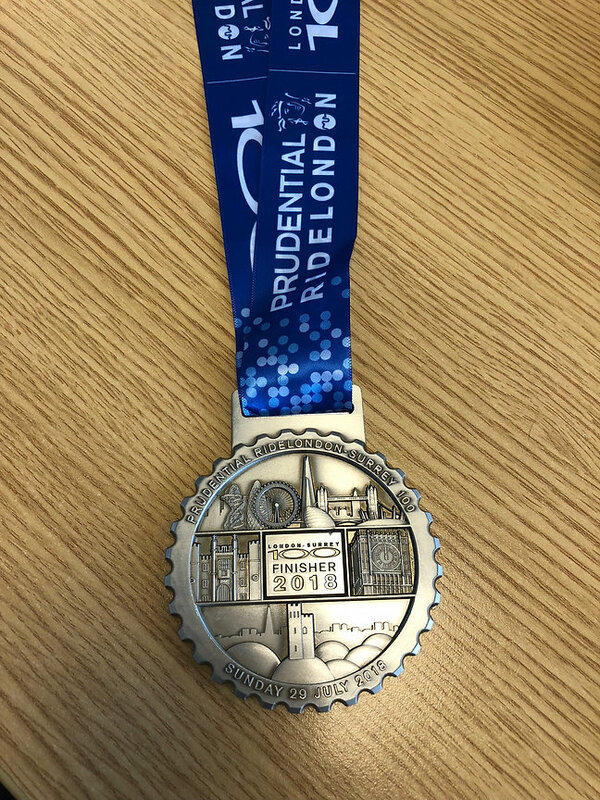 A brilliant ride, some brilliant support from spectators all along the route, the organisers and stewards did a great job and I’d love to do it again. So that’s 2 of our 3 rides completed, just London to Paris to go in September. And we’re closing in on our target of raising £14,000 for Bloodwise. 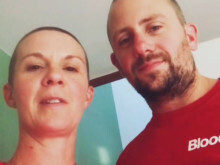 If you haven’t donated and would like to, please go to our Just Giving page here - www.justgiving.com/fundraising/taholatriple. If you’re reading this before the afternoon of 31st July and would like a chance to win a holiday for £10, go to this Just Giving page where you can find all the details - www.justgiving.com/fundraising/havenholiday.